Update November 2016: Just bought new more-comfortable beds and a new bigger full-hd tv for the living room! Now you can enjoy the Sky Tv subscription we offer! Without doubt, the most important feature of this place is that you'll find yourself in the heart of the "Chianti-shire", the most beautiful part of Tuscany (and probably of Italy), but still only a few minutes away from Florence (20-25mins). This house is part of a 14th century villa immersed in the Tuscan countryside, with a stunning view over Chianti hills. The excellent location provides easy access to the most important cultural and touristic locations of Tuscany, such as Pisa (1h10mins), Siena (1h), San Gimignano (45mins), Volterra (1h10mins), Monteriggioni (40mins), Lucca (1h), Arezzo (1h), Cortona (1h30mins). If you don’t want to use your car to go to Florence, a bus stop towards the city is about at 600m from the house, you'll find the timetables in the house. The surrounding countryside also offers the possibility of many fascinating routes on foot and bicycle and, for golf enthusiasts, the famous golf-club “Ugolino" is only 4 kilometers away. The house is on two floors: the ground floor is formed by the living room with fireplace and a fully equipped kitchen. Upstairs there are two bedrooms, one with a double bed and one with 2 single beds, and two bathrooms (both with showers). If you are 5, we can set a fifth camp-bed in one fo the two bedrooms. If you travel with a baby, don't worry! We are "family-ready", so we can offer you a cot, we can mount a safety gate for the stairs, set a highchair and a plastic bathing tub. You can use the big garden, from which you can enjoy a spectacular view of the valley, vineyards, olive groves and the adjacent woods, with a large lawn, table, chairs, deck chairs, barbecue and table tennis. Feel free to use the fireplace as well, just be careful :). I will provide toiletries and linen for you and in the house a washing machine and a dryer are at your disposal. There is a grocery shop that you can reach in 8-9 mins by foot and 2 supermarkets 5 mins away by car, one in Impruneta and one in Strada in Chianti. We offer Sky TV in the house, with lots of satellite channels that offer a range of movies and tv shows. There is wifi internet and private lit parking for your car. A few steps away there is our farm "Santa Cristina a Pancole" that produces organic wine and olive oil: during your stay feel free to ask me for one of our bottles! A large private forest is waiting for you to walk and go in search of mushrooms, berries! And I will give you a list of the most famous restaurants around the house for great meals. Read the reviews and you'll understand why staying in this home will be a special experience, that will make your vacation unforgettable. If you need to bring a pet, please let me know before you book your stay. I am a student in Florence grown up here with my family. I would like to share our second home with you. I speak English and I live in the house next door! This house has been handed down from generation to generation, and now we offer to tourists, convinced that you will be as excited as we are about living in this magnificent place. They’re were four of us staying there for six nights. We loved the property and the views. Very convenient location. The unit had everything we needed and more. We can’t wait to stay again. In May we spent a week at Giacamo' s house near Strada in Chianti and were very happy with our stay. Giacamo was away on our arrival but his Father was there to welcome us and help us settle in to the house. The house has a wonderful view of countryside so typical of Tuscany, olive trees, grape vines and tall cypress trees. From the bottom of the garden you can see the village of Strada in Chianti. The house is well equipped and comfortable, adequate kitchen with large fridge & dishwasher, the two bedrooms each have modern bathrooms. We appreciated having a washing machine and iron etc.. The garden has some shade for outside dining. The house is ideally situated for visiting Florence, Siena and San Gimignano. We used the local bus to visit Florence, the bus stop is near the local shop, about a 10 minute walk away. The local restaurant also situated next to the shop we found to be excellent, it was handy to have a restaurant within walking distance. You must follow Giacomo's instructions for finding the house, it is a little tricky as the sat nav will not take you right to the door. We would not hesitate in recommending this house, it is as good as it looks in the photos. 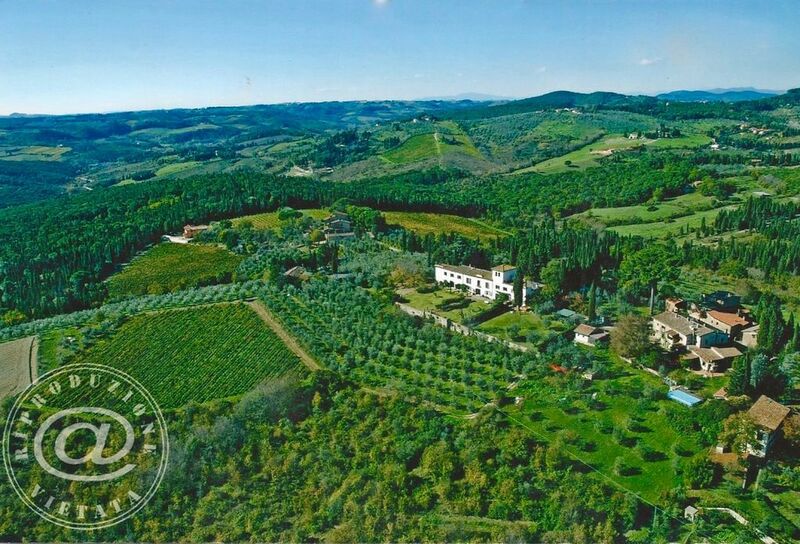 Beautiful property, spectacular view, excellent location to explore Tuscany. Giacomo's villa was the perfect home away for 2 couples visiting Tuscany for the first time to enjoy the vistas and the wine (both spectacular from the backyard terrace). Giacomo's father was very welcoming and helpful. High recommendation. Giacomo's villa in Santa Cristina is superb. The apartment is spacious, well-equipped, and beautiful - and that is before you look out the window. The view is always spectacular as the light shifts during the day. Thank you so much for these nice words. Hope to see you again in this region. Thank you so much Tatyana!